Happy Friday, folks! I feel like this weekend is going to be a good one – all of my friends are back in town, my sister is driving in tomorrow for a few days, and I’ve had a really great week. I don’t have anything specific planned, but I can just feel it! What do y’all have planned for the weekend? You may remember this clutch from a few years ago? Because it’s so bright, I don’t bring it out often, but it looks PERFECT with this little skirt I found at ASOS! It almost looks electric, ya might say… For some reason, I really don’t enjoy wearing shorts – I don’t find them flattering on me, and I’m always fidgeting and pulling at them so they sit right or don’t bunch up. Anyone else bothered by that? I still wear them from time to time, but if I could, I’d go skirt every time. Since it’s too hot to wear jeans (if you’re planning on being outside), I try to opt for light dresses or a skirt + top combo. It’s easy, breezy and keeps me as cool as possible. 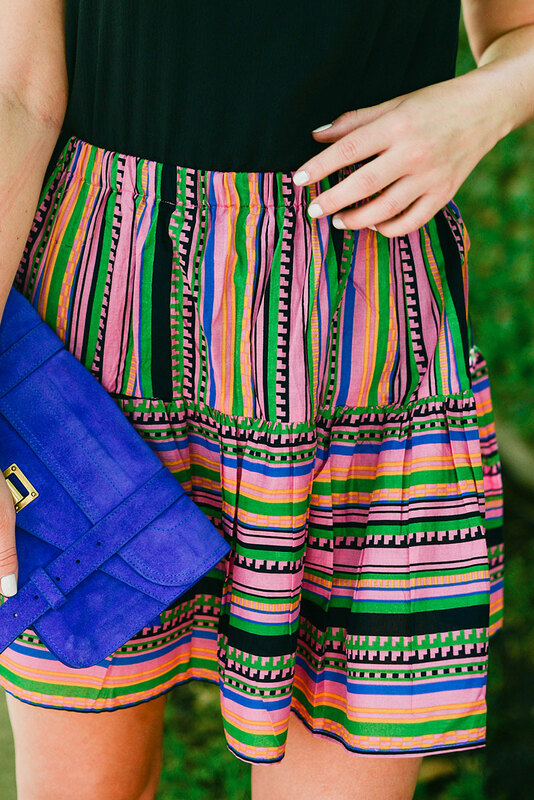 This colorful number is actually on sale right now for under $30! The perfect throw-on-and-go with your favorite black tank. I’ll probably wear it with flat sandals this weekend to brunch or happy hour! Hope you all have a wonderful weekend! That skirt is so cute, love the print. That skirt!!! Love it, I actually have a pair of shorts that are really similar and you’re totally inspiring me to pull them out over the weekend! I’m a sucker for brights so this is right up my alley! That bag is awesome! I’m so in love with that color! This skirt is AMAZING!! You look great! What a gorgeous look on you!